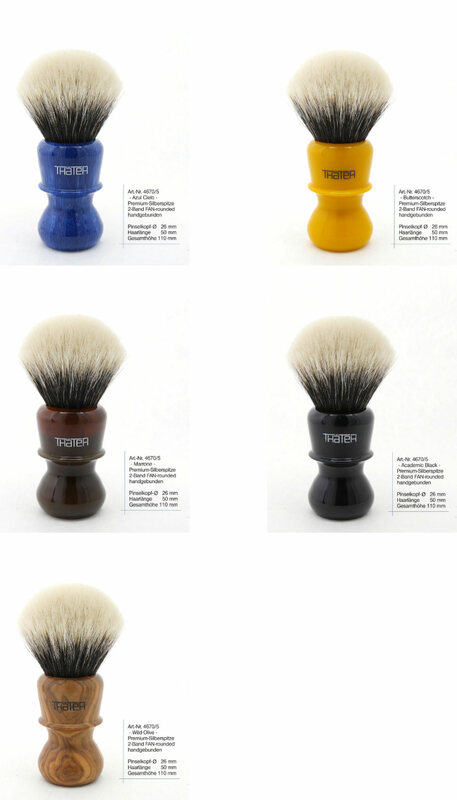 We are expecting a shipment of Special Edition Thater brushes this week. The brushes will have a new knot style -something that Thater refers to as fan rounded as well as a new handle style. The handles will be made from special material sourced from Spain and the knots will be two band badger. Here is a photo that I converted from a PDF file. I’ll take an olive wood! Great handles, and the knot specs of 26/50mm are optimal. They look to be very nice brushes. Thanks guys. I am not sure of the exact price yet but, they will be in the range of $185 for all but the olive wood version. That brush will be priced at around $210. (07-09-2018, 12:44 PM)bullgoose Wrote: Thanks guys. I am not sure of the exact price yet but, they will be in the range of $185 for all but the olive wood version. That brush will be priced at around $210. I have a question, is this going to be the standard Thater 2 band or the Thäter knot that is your behive or a different denser Thater 2 band soft tip knot? I have a question, is this going to be the standard Thater 2 band or the Thäter knot that is your behive or a more dense Thater 2 band? It is a different knot -fan rounded. I have no idea how dense it is compared to the beehives (I have not seen them in person). My preference would be a different Thater knot then what I already have (density with thaters soft tip) especially with a new head shape and handle. If it’s as dense as their 4125 2-band I might buy my first couple of badger brushes in 2-3 years time. Excellent looking brushes. I like the sounds of a fan rounded. Sums up my typical preference for a knot. I do enjoy a bulb knot, but those can quickly veer from drool worthy to cringe inducing too fast for my liking. Those are very nice brushes. I’m drawn to the olive wood as well. It’s quite attractive. The brushes arrived this afternoon and are now up on my site available for purchase. If these knots are the 4125 denser type knots from Thäter, they have enough backbone to satisfy most backbone lovers and everybody else. If they are the less stuffed knots, the people who enjoy cloud soft knots will love these, but they will be too floppy for my preference. Love the handles too !! 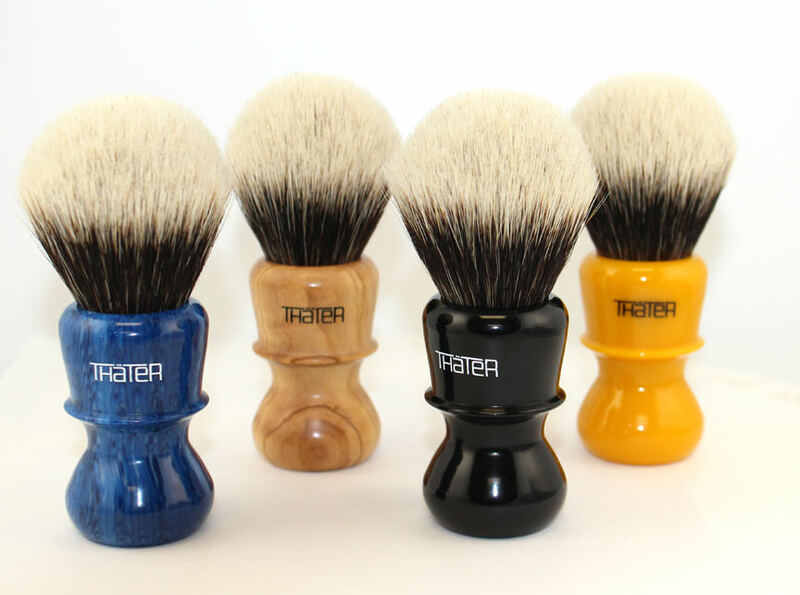 The 26mm Thater 4125 is a great brush, set to a 55mm loft. This new Thater SE is a 26mm set to a 50mm loft. I don't know how the density of the two brushes compares, but this SE should have sufficient backbone due to the lower loft. (07-11-2018, 10:41 AM)TheLegalRazor Wrote: The 26mm Thater 4125 is a great brush, set to a 55mm loft. This new Thater SE is a 26mm set to a 50mm loft. I don't know how the density of the two brushes compares, but this SE should have sufficient backbone due to the lower loft. Well my Thäter 4125 26 mm 2-band is from 2012/2013 with the plexiglass handle and set at 50 mm loft. This is exciting. I love the look of the tortoise handle. Any plans for a 3 band version? That sounds like a great brush Claus. I thought the plexiglass was model number 49125, and was not aware of a plexiglass bearing the 4125 model designation. In my post I was referring to the standard, current 4125 brushes with the octagonal handles. Their stated loft is 55mm. (07-12-2018, 07:37 AM)Gabe Wrote: This is exciting. I love the look of the tortoise handle. Any plans for a 3 band version? Not to my knowledge. This was a very limited run.